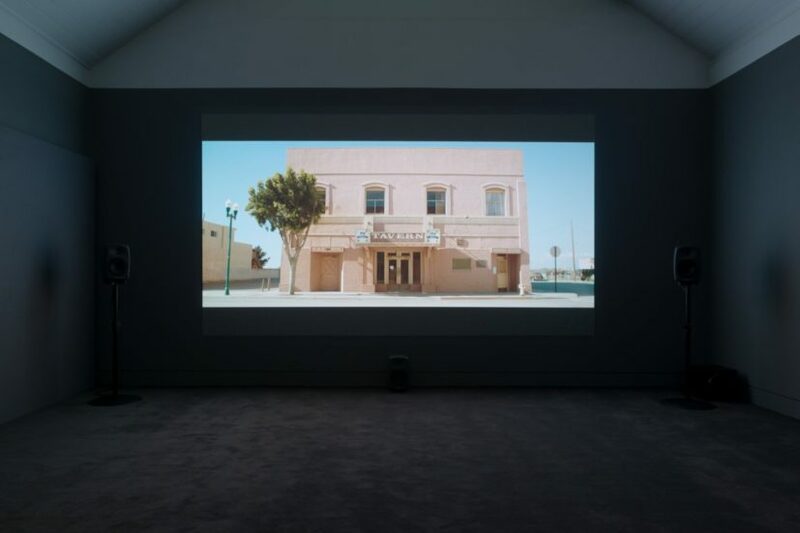 Installation view – Patrick Hough, And If In A Thousand Years, 2017. Commissioned for Jerwood/FVU Awards 2017: Neither One Thing or Another, supported by Jerwood Charitable Foundation and Film and Video Umbrella. Image: Anna Arca. Installation view – Lawrence Lek, Geomancer, 2017. Commissioned for Jerwood/FVU Awards 2017: Neither One Thing or Another, supported by Jerwood Charitable Foundation and Film and Video Umbrella. Image: Anna Arca. Lawrence Lek’s new film Geomancer opens with a re-enactment of the ‘Hand of God’ move South Korean gamer Lee Sedol used to defeat Google’s AlphaGo AI (Artificial Intelligence) in a game of Go last year. Sadly this was the only game out of five played where Sedol was able to triumph over the computer. Researchers use such games to determine whether an AI programme is better than a human at a particular task. As technology allows us to automate physical labour, tasks involving thinking and creativity could also be outsourced to algorithms. In fact, a recent article in The Economist cautioned humans to take note of the fate of the horse, superseded and then rendered obsolete by the motorcar. We will eventually be made redundant by robots it warned; the glue factory awaits us. Lek invites us to sympathise with the aspirations of an AI, rather than fear them. His 40-minute video is a gorgeous journey into a multi-layered future reality, a speculative Singapore in 2065, which swirls calmly overhead as we sit on the floor, unmoored from place and time. Our narrator is an AI satellite, the Geomancer of the title, who had been built for the purpose of environmental monitoring but who dreams of being an artist, a career path banned to AIs. As with any examination of AI, Lek makes us think about what it means to be human. The protagonist’s adolescent consciousness is seeking self-determination. Even though an AI is in many ways an ultimate kind of ‘other’ for a human, it wants to feel unique and to have meaning and agency in its life. Lek imagines an AI might make artwork more based on copying than originality, as they have no eyes or senses but endless memory. He suggests that a future consciousness that can win at games of skill might be attracted to the irrationality of gambling for entertainment. 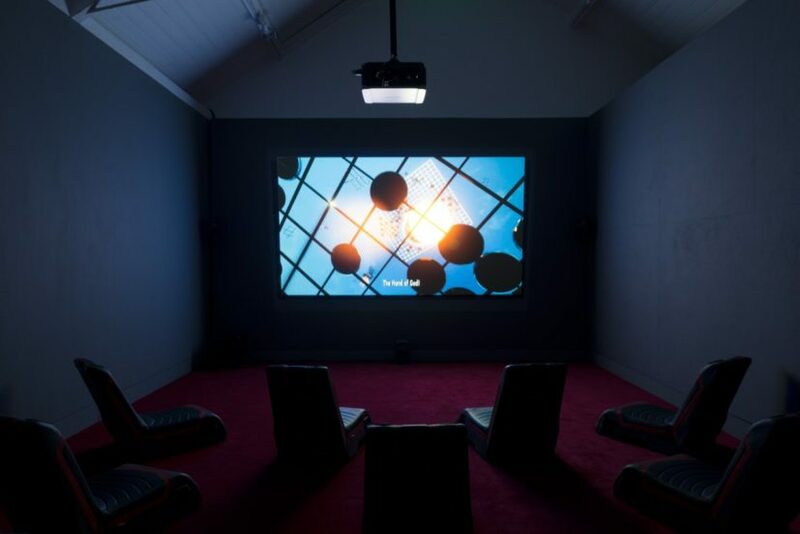 The film culminates with Geomancer dreaming, a sequence that consists of a re-rendering of the film based purely on its brightness and pixel position data. Geomancer grew out of Lek’s notion of SinoFuturism, presented in a recent video essay SinoFuturism (1839-2046 AD). With a nod to Afrofuturism and Gulf Futurism, SinoFuturism (1839-2046 AD) presents a critical and playful approach to subverting cultural clichés and anxieties around the ascendancy of East Asia, by interpreting China’s development as a form of AI. 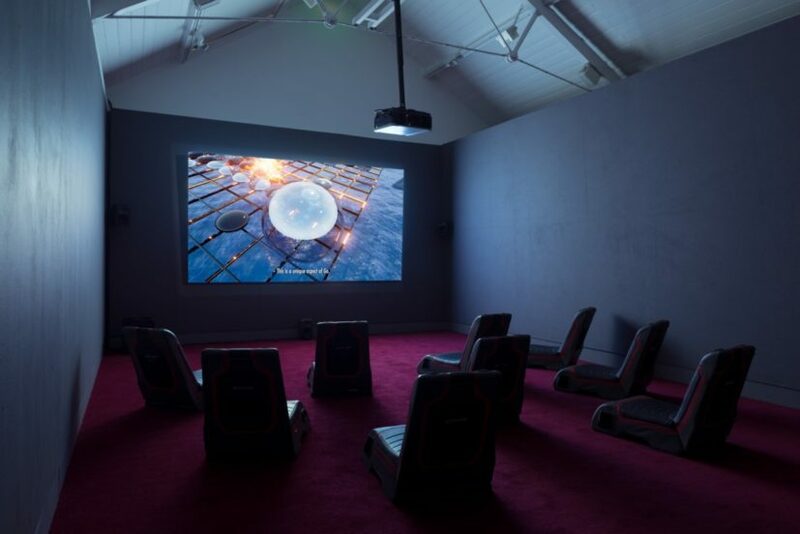 Lek has become well-known in London for his speculative works using gaming software video that reflect on the impact of the digital on our perception of reality. Look out for his new project in Art Night on 1 July. Patrick Hough’s film And if in a thousand years (2017) starts with an excavation in the desert. The scene is ambiguous: are those ancient Egyptian artefacts being unearthed, but why are they made of plaster? This is no statue of Rameses the Great, uncovered in a Cairo suburb; it is in fact the remains of a film set, for Cecil B. DeMille’s 1923 silent epic The Ten Commandments. For DeMille’s production 21 plaster sphinxes were produced alongside numerous enormous temples and statues of pharaohs. After filming wrapped these props were buried in the sands to prevent them being reused. There they remained until, in 2014, one of the sphinxes was dug up and placed in a local Dunes Centre museum. In his new 20-minute video, Hough focuses our attention on this rare example of a fictional representation of history becoming an archaeological site. He invites us to think about how we relate to the past in the present, rewriting history in light of our own subjective viewpoints. Hough also asks us to listen to the story of a non-human and reflect on human subjectivity. DeMille’s sphinxes were gender fluid, sharing characteristics with both the male Egyptian ones and the female Greek variety. In Hough’s work one of this army of mythical creatures is resurrected and roams the dusty American town, finding itself in the local museum viewing the recently unearthed remains of its body. In a weary voice-over, full of the gravitas of an Old Testament prophet, this replicant-creature struggles to understand that it is a digital representation and to come to terms with its reincarnation. 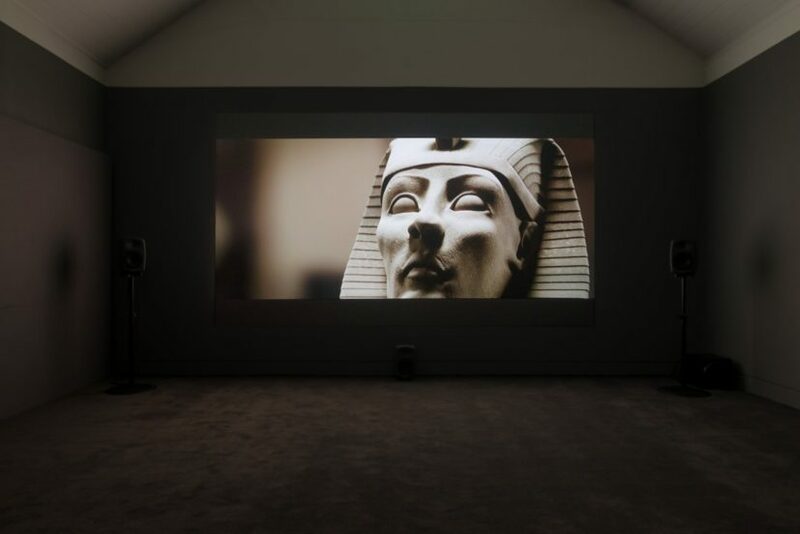 In the closing scenes of the work we see the town through the eyes of this digital Sphinx, who moves its head back and forth like a predatory cat. Its vision takes the form of LiDAR technology, common in archaeology, which renders the street in clouds of hundreds of thousands of points. 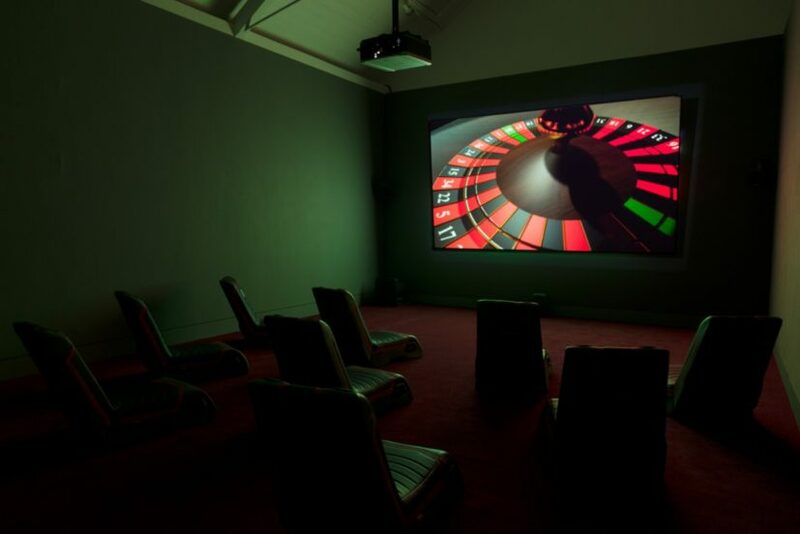 In Hough’s practice the authentic and the replica become blurred as he probes the relationship between technology, museology and cinema. His earlier series of photographs Ouarzazate (2010-11) record the remains of film sets abandoned to the elements in the Moroccan desert. From Mecca to American gas stations, this series presents a warped chronotope, creating a confused sense of place and past. Meanwhile in his recent work Hierophanies (2017) he has created a 3D digital animation that reconstructs a sculpture destroyed at Palmyra by ISIS. These two ambitious and thought-provoking videos are on view at Neither One Thing or Another, this year’s Jerwood FVU Awards at the Jerwood Space in Southwark. Lek and Hough were this year’s award winners and both responded to the curatorial theme by using pioneering technology to examine a blurring of the line between the real and the artificial. 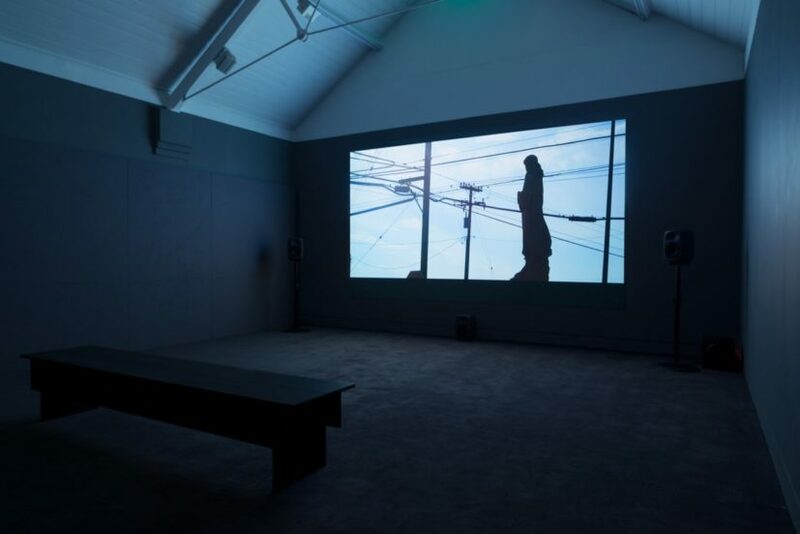 The exhibition is on at Jerwood Space until 14 May and the works will then tour to various venues including Arnolfini, Bristol; CCA, Glasgow; FACT, Liverpool; HOME, Manchester, Phoenix, Exeter; Phoenix, Leicester and Tyneside Cinema.